With more than 34 years of experience in building design and construction, Lynn Taylor’s life work is to empower, equip and educate homeowners. She acts as a bridge between contractors, preservation zoning staff and her clients, working together to navigate the process of historic overlays and the guidelines required. Lynn elevates housing design from a technological skill to an art from by weaving design elements together with the convenience and technological advances that modern living demands. As a child, Lynn was an artist. She was always doodling and drawing in and on things in school. She even got in trouble in the first grade for drawing in another student’s book. From elementary to high school, she was always drawing. Her favorite thing to sketch? Trees and comic book characters. In high school she took four years of art and two years of vocation drafting classes. During Lynn’s senior year in high school she won the Art Award and the Drafting award, which set the stage. As a high school senior, she won awards for both art and drafting. Already the foundation for her life work had been set. When Lynn was a child her father hand built a log cabin for her mother. Later Lynn would go on to construct a replica out of clay for a pottery class. Her father built houses and her mother was a cosmetologist, both entrepreneurs. But it was her father’s tradesmanship that really left an impression. It would be this motivated, self-starting approach that would move Lynn into starting Taylor Made Plans and it is her family’s work ethic that would prove the differentiator. Once she graduated from high school, Lynn wanted to be an artist but her father advised against it, prompting her to sign up for engineering classes at MTSU. Feeling stifled and conflicted, Lynn dropped out and enrolled in the Nashville State Technical Institute, getting her degree of Engineering Technology and Architecture in 1986. It was her experience at the Nashville State Technical Institute that would open the doors for Lynn in the architectural world. From there Lynn would go onto Orlando, Florida to work as a residential designer for a few years between a handful of firms. 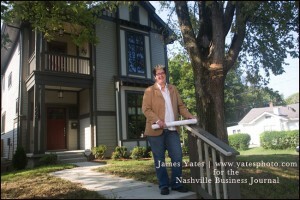 Lynn moved to East Nashville in 1993 after dabbling in residential design since the late 1980’s. 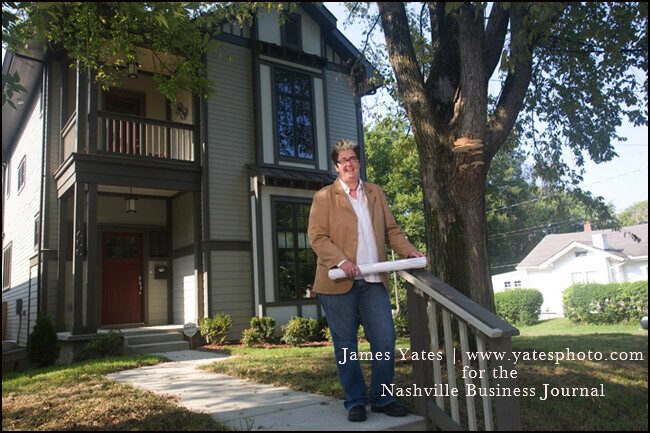 But it was her move to Lockeland Springs in East Nashville that ignited her passion for historic preservation and design. She began with a design for the single house in her neighborhood, which opened the door to work in historic neighborhoods. In January 2000, Taylor Made Plans was launched to provide a fresh option for those seeking historic house plans and renovations that are creative, consistent with their neighborhoods yet still affordable. Lynn’s designs have been featured in local and national media, including “Generation Renovation” on HGTV and Old House Journal. They have also won countless awards, including the 2013 infill award from the Historic Commission of Metropolitan Nashville-Davidson County, the 2005 infill-housing award from the National Trust for Historic Preservation and Old-House Journal’s Great American Home Award. In the past, Lynn has inspired younger women by participating in the Girl Scout program An Income of Her Own. Lynn has encouraged other business women to enter business contests, such as Oxygen’s “Oh, Get the Money!” campaign. Through winning this campaign, she demonstrated the first step to winning is entering. In addition to running her business, regular speaking events and leading workshops, she donates time and resources to Magdalene Thistle Farms, thereby providing opportunities for women to learn job skills and improve their lives. She was Project Drawing Coordinator in 2007 on the 4,200+ square foot Magdalene house build. In 2009, Lynn donated a new 1,258 square foot house design to Magdalene and pulled the design and construction team together so they could build an Earthcraft house for the women. On this very special venture she served as Project Designer, Manager and Construction Administrator. Lynn Taylor is currently a member of American Institute of Building Design (AIBD), National Trust for Historic Preservation, The National Alliance of Preservation Commissions, Tennessee Preservation Trust and Historic Nashville. Some of Lynn’s hobbies are arts & crafts, bicycling, creating hypertufa planters and taking long walks. 2008 to 2011 – served two terms on The Metropolitan Government of Nashville and Davidson County, Board of Plumbing Examiners and Appeals from.